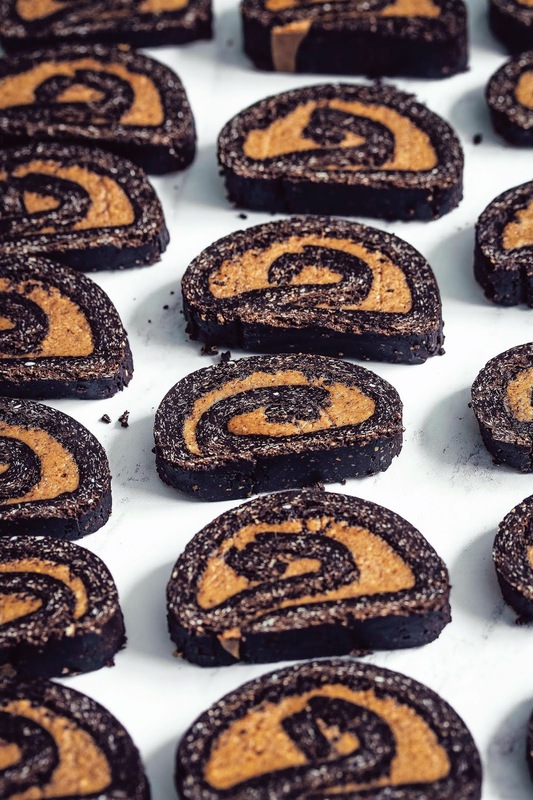 These peanut butter chocolate pinwheels are so easy to make and require no baking at all. Mix the dough ingredients in one bowl and the peanut butter in another, roll out, spread, roll into a log and slice. Done! They’re made using simple and healthy ingredients like oats, cocoa and peanut butter. Much healthier for you than your average shop bought treat. 2 cup (230g) oat flour – plain rolled oats blended into a flour in the food processor. Use gluten-free oats if necessary. To make the chocolate layer – In a large bowl, mix together the oat flour, cocoa and salt, then mix in the maple syrup, vanilla and melted coconut oil. You should end up with a dough consistency. Roll out between 2 pieces of parchment paper to about 1cm thickness. To make the peanut butter layer – Mix the peanut butter, peanut butter, vanilla and salt in a bowl, then spread onto the chocolate layer. Roll up carefully and tightly. Wrap in plastic wrap and chill for 2 hours before slicing. 0 Response to "NO-BAKE PEANUT BUTTER CHOCOLATE PINWHEELS (VEGAN & GLUTEN-FREE)"